Ahhhhh – Popeye for the Nintendo Entertainment System, it’s one of the grandpa cartridges from the NES era. When the NES was first launched it North America, Nintendo standardized the packaging design for the first 30 cartridges they published. They had different series lines such as “action series”, “sports series”, and “lightgun series”. 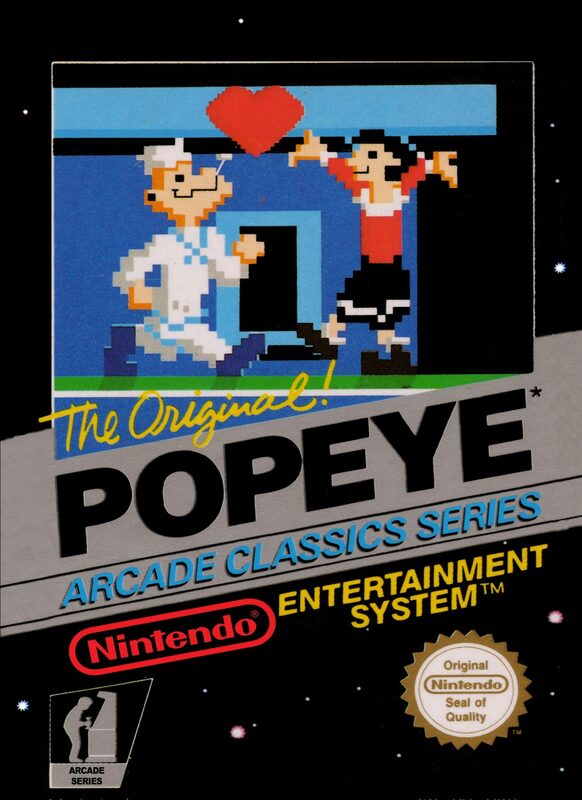 Popeye and a few other titles fell under the “arcade series”. Nintendo always had a thing for Popeye. I don’t know if it’s something to do with the characters appeal to the Japanese market or just internally to Nintendo, but they always tried to make a Popeye game. Their first attempt was in the 1980-1981 time frame. They had designed this arcade game where Bluto kidnapped Olive Oyl and Popeye had to go rescue her. This involved climbing obstacles, reaching Olive, and then going to the next level to save her again. Nintendo was unable to procure the licensing for Popeye and had to reskin and adjust the game. The sprites had to be reskinned to bring the game to market. 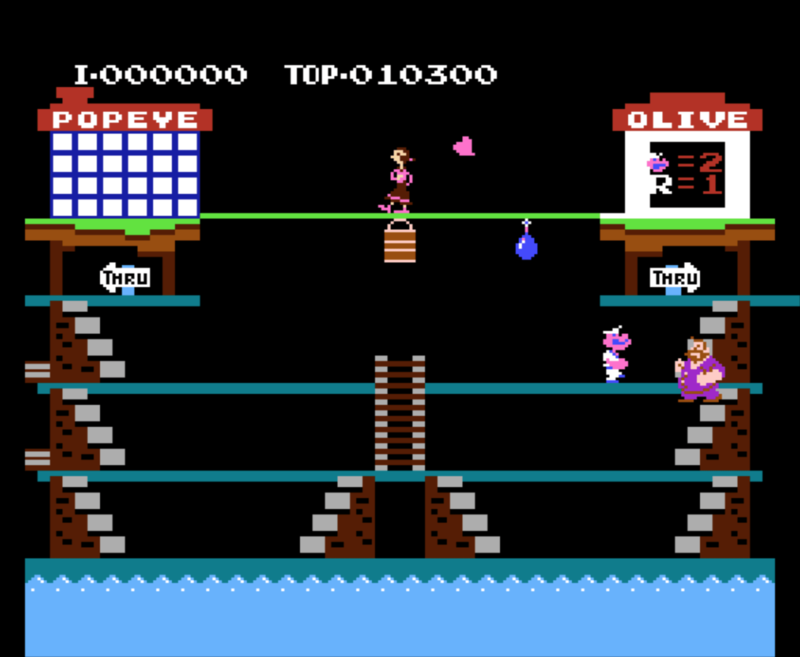 Olive was changed to Lady, Mario to Jumpman (Mario), and Bluto became Donkey Kong. Donkey Kong became one the defacto games of the 80’s arcade era. Now we all know how much of a tremendous failure Donkey Kong was. It was the game that almost put a nearly hundred year-old company out of business. Most people haven’t even heard of it today. While Mario escaped to become a megastar, Donkey Kong himself was never heard from again. I’m sure King Features Syndication was happy to not allow Nintendo to use that license. But, there must have been some sympathy by King Features Syndication, because two years later they allowed Nintendo to try again. This is the arcade game that everyone remembers. The one that eclipsed Donkey Kong into obscurity. It outshined luminaries such as Space Invaders and Pac-Man. It caused a national shortage on quarters. It…..well….It’s an ok game. It was a game of mid-level popularity. We know that if the game that became Donkey Kong had been Popeye, Nintendo would be making games such as Popeye Country. Luckily for them in the long run they aren’t forever linked with Popeye being the mega star. Arcade GameplayTo be fair when you look at the graphics from the arcade game footage above, it was a sharp-looking game for its time. It just didn’t snag those looking to score time on the next mega hit. Honestly, by the time I was old enough to appreciate arcade cabinets and pay attention to them – I think I may have seen Popeye once. I believe it was in an arcade on the pier in San Francisco. I didn’t play it though, I dumped quarters into the original Star Wars arcade game. Popeye has been ported a few times. When Nintendo released the Famicom (the Japanese NES), Popeye was one of the first three games released for the system. Since it was a known brand, an arcade game that I’m sure people were aware of, and developed in-house. It was a no brainer for the system to be released for Nintendo hardware. Since it had already been ported to the Famicom it was only a repackaging that allowed it to be ready for the North American market. NES GameplayLooking at the NES footage, the graphics are nowhere near as sharp as the Arcade Version. The gameplay is solid though. One thing I’d like to comment on is that if the game that became Donkey Kong had been Popeye – the NES character graphics would likely have been very close. I don’t see Popeye in the NES footage being that much less distinct than Mario in Donkey Kong. It could just be me though. This game isn’t something I just pulled out of a hat to discuss though. This game and I have history together. While I did not play the arcade cabinet, I played the hell out of the NES version. This all goes back (to quote the Goldbergs) 1980-something, it was the era of NES and game were expensive. Since most of us could only accumulate a handful game the era of temporarily trading video games was en vogue. So, I didn’t own the game I managed to score on a lending basis. My family would take regular trips to visit my family in Greenville, OH. My Godmother and Mother were close so we would visit her every time I visited. I can think of great times hanging out with her son – watching the premiere of the Thriller Video, taking two dollars up the road to teefers and buying an obscene amount of candy, getting the scar on my chin that is hidden by my beard these days – you know, the usual childhood best friend that you only see two-three times a year stuff. Now before you think I’ve gone off the rails, on one of my visits we were playing video games and we were playing Popeye. For some reason I was completely engrossed in this game. Since Greenville was four hours away from where we lived, I don’t know if I had planned for a trade and brought something with me. I may have just asked to borrow it. Regardless, Popeye became mine for a time period of three to six months. Since I had already played the hell out of my mediocre collection, this became my game to master for a while. Since the gameplay is very repetitive (like most arcade games), I remember being quite good at this game. If I would have had a chance back then to translate into arcade prowess – I may have been middling decent at it. Not “OMG This is the most amazing player in the arcade” good, but enough that I wouldn’t feel embarrassed going around more seasoned players. However, knowing how other things go gamepad skills were a bit different from arcade joystick stills. While I don’t have the same cartridge I spent all those hours on, I do own a copy of Popeye for the NES. It’s not borrowed, but it is blue. I don’t love it enough to marry it though. I do think I paid 15.00-20.00 for it when almost all the games I was buying were under the 10.00 mark. It was something that I had spent so much time on that I had to have it my collection. 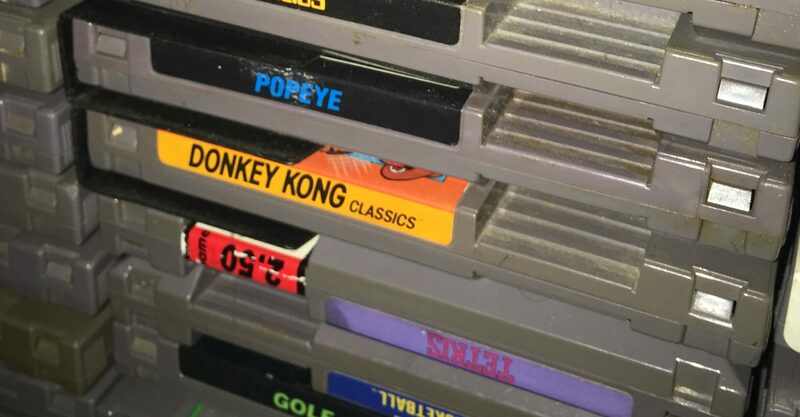 I would love to say that the fact it is sitting above Donkey Kong was intentional. Maybe though, it was my unconscious mind doing that. Knowing they would forever be linked with Popeye being the mega Nintendo hit and you scratching your head going Donkey Who?